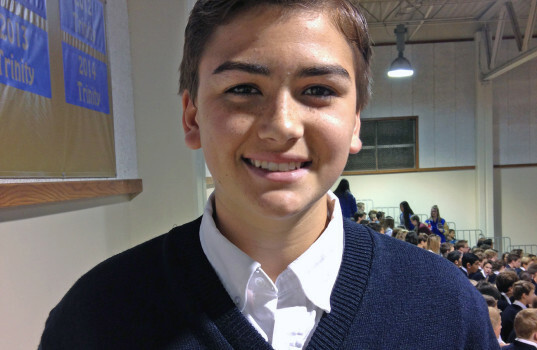 Cole McCutcheon, 8th grade student at St. Anne School in Laguna Niguel, is a model student. His positive attitude and huge heart make him a leader among his peers. He has mastered the art of balance, being actively involved in athletics and leadership programs on and off campus, all the while encouraging his friends and classmates. He plays flag football, basketball and volleyball for St. Anne School, and is actively involved in traveling baseball. His involvement extends far beyond the sports field. Cole is a WEB (Where Everybody Belongs) Leader, mentoring new St. Anne middle school students. WEB Leaders like Cole run fun activities throughout the year, build bonds with the 6th grade students, and help support their transition into middle school at St. Anne. Cole is also involved in Rachel’s Challenge, a program that proactively stands up against bullying.